T he day begins early for visitors to Sridhama Mayapur. They wake many hours before the sun rises, anytime between 3 a.m. and 4 a.m., to bathe and prepare to go to the early morning mangalarati. At the temple, the pilgrims get in line and wait to enter the temple. Sometimes, the lines can reach up to 400 or 500 meters! 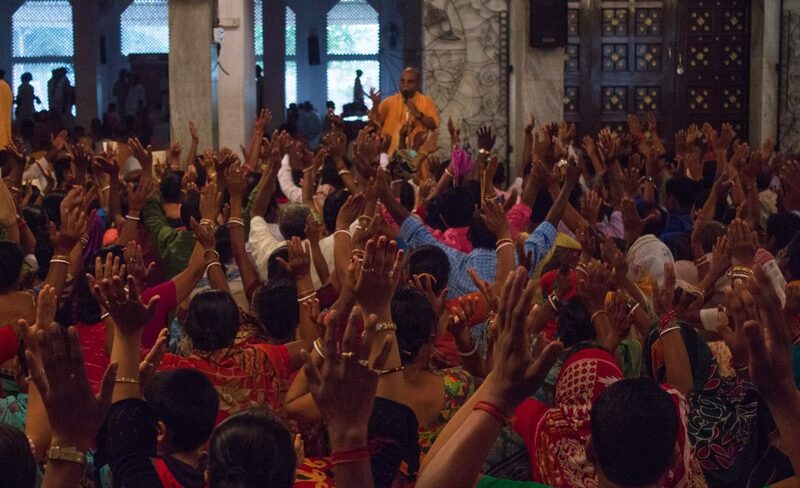 After mangalarati is finished, the devotees in the Sri Mayapur Chandrodaya Mandir disperse to various places to chant their japa or do service. The pilgrims are encouraged to stay in the temple and are engaged in chanting a round of japa by an enthusiastic brahmachari. Every morning after Nrsimhadeva arati, this brahmachari gathers the visiting pilgrims and teaches them how to chant the Hare Krishna maha-mantra on japa beads. 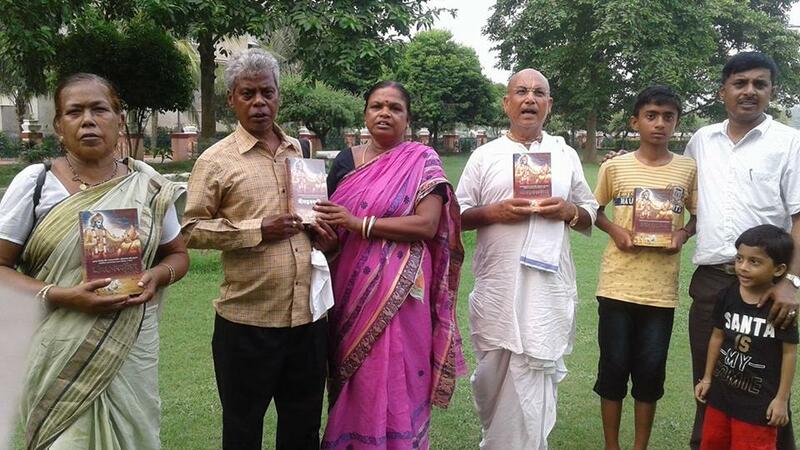 After he teaches them how to chant and they all chant one round of japa together, he shows them books that introduce the basics of Krishna consciousness and many of the visitors purchase the books. 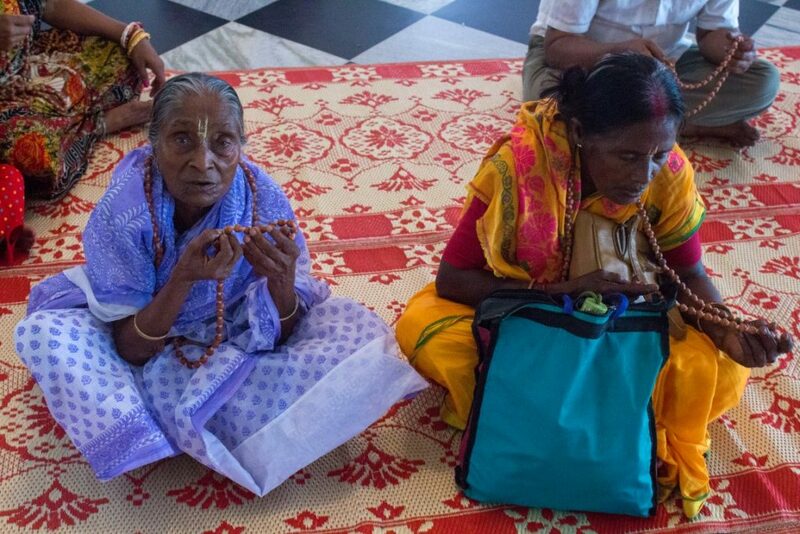 They are also given a prasadam coupon for free lunch at the Bhaktivedanta Annadana Complex as part of the Gauranga Prasadam program, which is one of the many Food for Life programs in Sridhama Mayapur. After this, pilgrims are given a free pass to go through the Caitanya Exhibition. This exhibition is located at the back of Sri Sri Radha Madhava’s temple hall and displays various pastimes of Sri Krishna Caitanya Mahaprabhu in His hometown, Sri Mayapur Dhama. Each display has an inscription describing the various pastimes in English, Bengali and Hindi. These colorful and lifelike exhibitions make the pastimes and life of the Supreme Lord come alive and leave a lasting impression on the minds and hearts of those who attentively go through the entire exhibition. A team of four devotees serves and takes care of the many pilgrims who come and visit the Caitanya Exhibition daily. Approximately 120,000 pilgrims go through the exhibition every year. At 7a.m., the Bhog Bhandar opens. The Bhog Bhandar is a counter that is situated just outside the main entrance to Sri Sri Radha Madhava’s temple and which supplies fresh and dried fruit, sweets like pera or laddu, tulasi leaves, flowers, ghee lamps, and incense to those who visit the temple and desire to make an offering to the Lord. There is a small counter where devotees and pilgrims can choose different varieties of bhoga ranging in price from five rupees to one thousand rupees. This gives everyone the opportunity to directly serve and make an offering to the Lord. They can make offerings to Sri Sri Radha Madhava, Panca-tattva and Lord Nrsimhadeva, and after the offering, they receive the maha-prasadam along with some maha tulasi leaves and manjari flowers from the Lord’s lotus feet. After the morning program, pilgrims roam about the ISKCON Mayapur campus as they like. 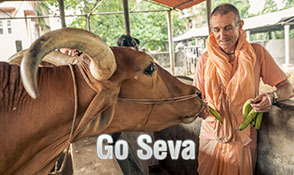 Some go to the ISKCON Mayapur Goshala to see the resident cows and bulls, as well as to worship and feed them. 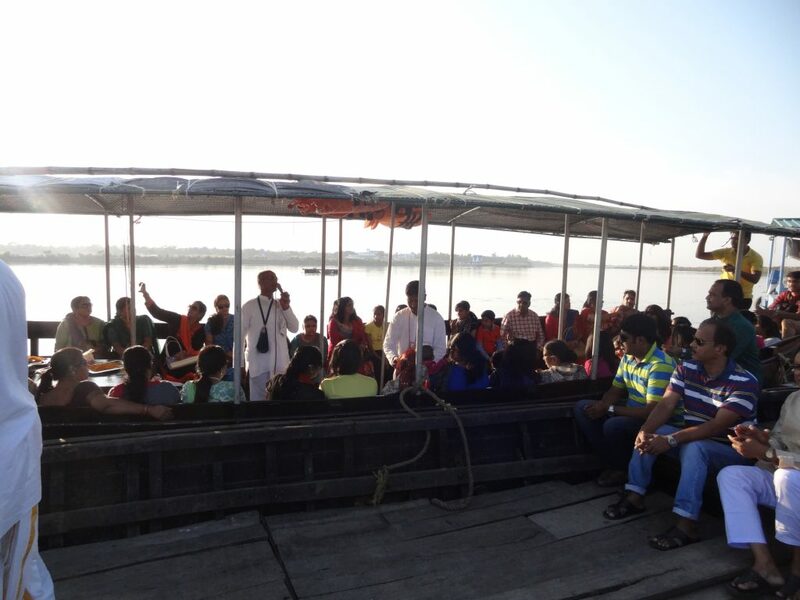 Mayapur Tourism is an initiative of ISKCON Mayapur to facilitate pilgrims during visit to Mayapur. Free guided ccampus tour and Ganga boat ride at noon are very ppular among pilgrims. 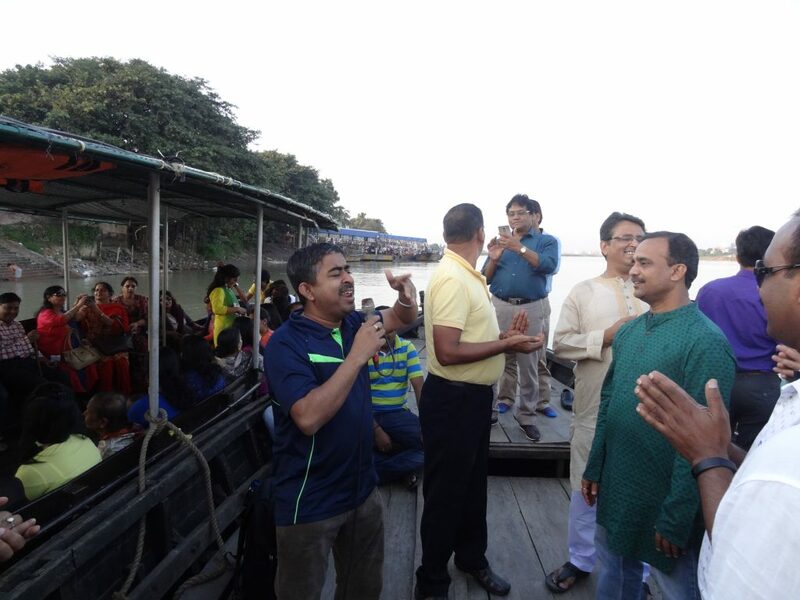 They go for an hour boat ride in Ganga, offer Ganga puja and Arti and are also encouraged to sing Hare Krishna Mahamantra. 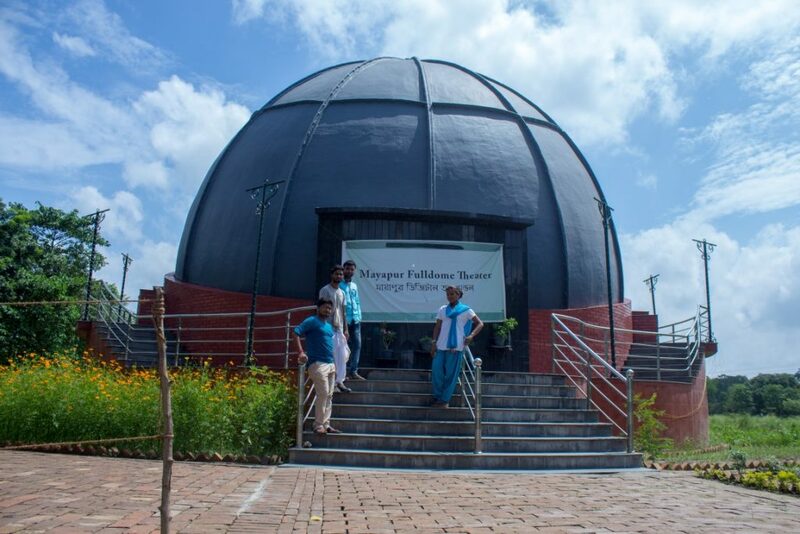 The Mayapur Fulldome project is a new development that visiting pilgrims can participate in. It is an immersive 360-degree fulldome that presents high quality video presentations about various subjects from the Bhagavad-gita As It Is, Srimad Bhagavatam, and other Vedic scriptures. There are two videos being presented so far, both in Bengali and English and with Hindi soon to come. 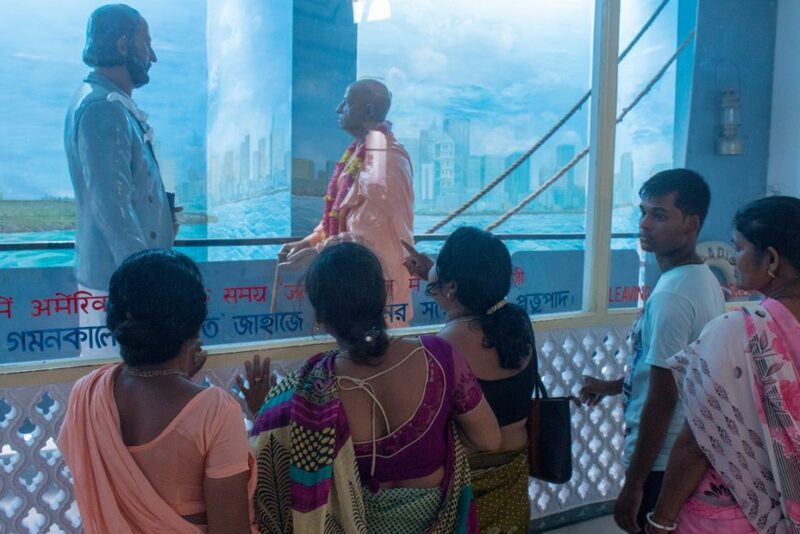 They can also visit Srila Prabhupada’s Samadhi Mandir, wherein they can learn more about the Founder-Acarya of the International Society for Krishna Consciousness through a diorama exhibition about his life. The views of and from the Samadhi Mandir are breath-taking, and visiting pilgrims can spend time on the roof feeling the cool breezes from the serene Ganges. They can also go on tours around the Samadhi and look at the various diorama displays both inside and outside the Samadhi, or can sit in the Samadhi gardens and relax. 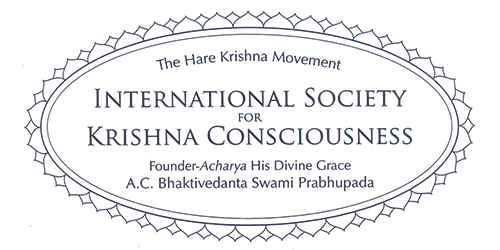 Every day near the ISKCON Govinda’s restaurant, pilgrims can attend a Brahma Jignasa class, which is a Questions and Answers session that teaches the basics of Krishna Consciousness. These classes usually begin at 2 p.m. and can go on until 5:30p.m. The classes conclude with the chanting of one round of japa and a bowl of fresh, hot, and delicious kitchari. Some visiting pilgrims go the ISKCON Rajapur Jagannatha Mandir to take darshan of Lord Jagannatha, Lord Baladeva and Subhadra Maharani, Simantini Gauranga, Sri Mahadeva, and Jayananda Thakura’s samadhi. There, they can also honour Lord Jagannatha’s maha-prasadam and relax in the gardens and mango grove within the temple premises, where there are also swings for children to play on. Srila Prabhupada wanted to attract the whole world to Mayapur, as it is the spiritual capital of the world. He wanted to show the science of Krishna Consciousness, and how it is a way of living, not just some ordinary religious cult. On a morning walk in Mayapur, Srila Prabhupada mentioned that people will come to see the civilisation and philosophical culture through practical demonstration, just as they come to see the architectural culture of the Taj Mahal. When people come and visit the holy dham, they are changed forever – whether they are aware of it or not. Not only do they take away a wonderful experience, but they take Krishna consciousness with them in the form of the holy names, Srila Prabhupada’s books and Prasadam.